I started reading Lost: The Official Magazine at around the same time I began watching Lost. The first issue I bought was the "Season 3 Is Here" issue, the seventh issued. I've bought as many issues of the magazine as I could since then, but have not been able to get back issues of the magazine, and therefore have not yet read the first six issues of the magazine. I'm sure that's the case with many of you as well. So imagine my happiness when I found out that Titan Books was coming out with a compilation book of their best articles, mainly from the ones I missed! The book, titled Lost: Messages From The Island, is slated to be released June 30 by Titan Books (the sister company of Titan Magazines, who publish the Lost magazine. I received my advance review copy of the book today, and I must say that it quickly took away any want I had for back issues of the Lost magazine. It's a paperback, and in its 176 glossy pages, the magazine encompasses everything I love about Lost magazine, and everything I was afraid I had missed. It's a truly stunning collection of behind-the-scenes images and interviews that has just as much value as any special features on the DVD. The full-sized book starts with an introduction from show creators Damon Lindelof and Carlton Cuse, thanking the creators of Lost magazine for helping to compile "this engaging and entertaining slice of Lost history." Ending with the salutation "Peace, love, and Namaste" (a phrase sure to live on in the Lost fandom), the letter adds an official weight to the magazine. It's the first of its kind since the season one guide The Lost Chronicles, and it's oh-so-much better. However, the real gems in the book are wonderful interviews with the production and post-production crew of Lost, like set designer Ron Yates, who discussed the conception of the raft, along with great concept art that shows just how deeply sets like that are thought out. There's another section of concept art that shows the wreckage of flight 815 as it was originally planned, in which the tail section landed on the beach with the rest of the plane (an idea that we know was later scrapped in favor of the tail section crashing on the opposite side of the Island). Another piece of concept art shows the tunnel leading into the Swan station, another intricately thought-out set design. There's a nice storyboard of a scene from "Man of Science, Man of Faith," in which Kate gets lowered into the hatch that is quite interesting, especially when placed side-by-side to screen captures from the actual episode. Still photos from both the episode and behind the scenes by Mario Perez dot each page, and give us a deeper glimpse into the world of Lost, as does the rest of the book. Though only season two is covered, the book is a worthwhile read, especially for those who were (like me) unlucky enough to get the first six issues of the magazine. Paul Terry teases that another "Best of" collection may be coming in the future, and I must say, I cannot wait for it to come. If it's anything like this one, it'll be a definite keepsake. But I'm getting ahead of myself -- I'll still be poring over this book for months to come! 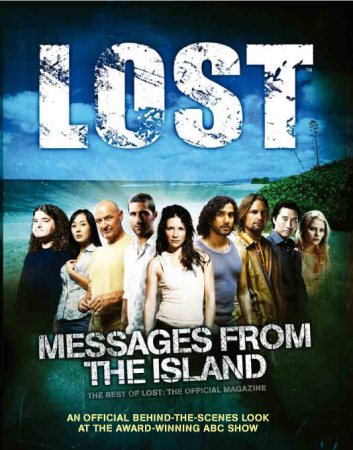 Lost: Messages From The Island will hit shelves on June 30. You can pre-order it from Amazon now. It's worth every cent.